The Laboratorio Arte Alameda is a center for contemporary art in Mexico City. It is located in a former Catholic church built in the late 16th century, historically significant as a main headquarters of the Spanish inquisition. Today this institute finds itself at the center of cultural and economical change in this mega city. The Cathedral is surrounded by Central Park Alameda, a busy market area, two major thoroughfares (Paseo de la Reforma and Av. Hidalgo), a metrobus-station, a subway station,and a helipad for a news headquarters. A “Tuning Tube” was installed on the roof of the church overlooking this active sound environment in order to reduce all surrounding sounds to an resonating overtone series in Eb. (As if the city was playing a vast digeridu) A microphone placed at a harmonic node in the tube, sent real time audio from the tube to a mix position in the Cathedral. This single channel was split into 6 separate feeds which were equalized and tuned to both the special speaker systems, and the very specific attributes of the architectural space. The resulting sound field was spectacularly spatial as low, mid and high sound sources activated a dance of harmonic spaces in the church. The lowest overtones went to a subwoofer on the floor, activating long rolling wavelengths from one end to the other; low-middle overtones to a large speaker in the choir loft, activating the arched ceiling through the length of the cathedral; mid -high overtones were tuned to specific ceiling arches on opposing ends of the building; and a specially constructed two-channel high frequency “chandelier” was suspended pointing upward into the central dome. This approach allowed O+A to tune the tube’s overtones very specifically into the architectural and acoustic features of the cathedral, much as an organist tunes the registers of pipes on a church organ to activate the space to greatest effect. 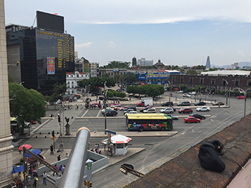 The result was a meld of acoustics, music, architecture, with the real-time input of the sounds of a city and all that implies – society, economy, scale, energy, and the humanity and rhythms of life in a megalopolis- Mexico City was heard as a song of itself, dancing in the spatial grandeur of one of its early historical sites. . . . . an acoustical “mural” of current urban life, 2016.